Metal roofs provide an excellent solution for protecting your buildings’ assets. However, over time, like most roofing materials, the grommets and sealants can break down and weather, causing leaks and rust to develop which weaken the long-term performance of the roof. You’ll have two options, replace the roof entirely (which will cost a fortune and take awhile to complete) or you can restore your metal roof with a Metal Roof Coating System. Exceeds ASTM D6083 requirements offering excellent tensile strength, elongation and wet adhesion. Energy Star® Partner - Product in white, meets the Energy Star®guidelines for energy efficiency. 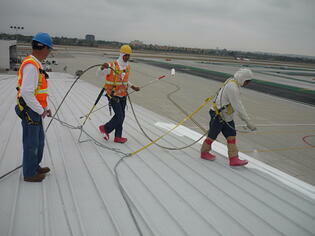 Metal roof substrates are very popular for commercial roofing because of their strength and ease of application. After some time, these roofs need to be maintained because the grommets and sealants begin to weather, causing rust to develop. Over time, the rust will weaken the long term performance of the roof, causing leaks and other damage to the substrate. National Coatings has a lasting and durable solution to solving rust issues - RustShield A120, a high performance rust primer that inhibits the future growth of rust after it has been removed in the preparation phase of application. RustShield A120 is a single component, low VOC, water based rust-inhibitive primer. It is used over ferrous and non-ferrous metal surfaces to provide excellent resistance to flash rusting and outstanding corrosion protection. NASA chose National Coatings' RustShield A120 product to be used on their Ares I-X rocket due to its superior strength and ability to shield against rust. RustShield allowed NASA to maintain the rocket's exterior integrity while it passed through the salty air above the ocean before entering into Space.